iPiccy is a powerful web image editor that is focused on good tools and serious work. While many other image editors focus themselves on fun factors and easy image enhancing with sparkly effects, iPiccy will be welcomed by many with its powerful tools and editing features. 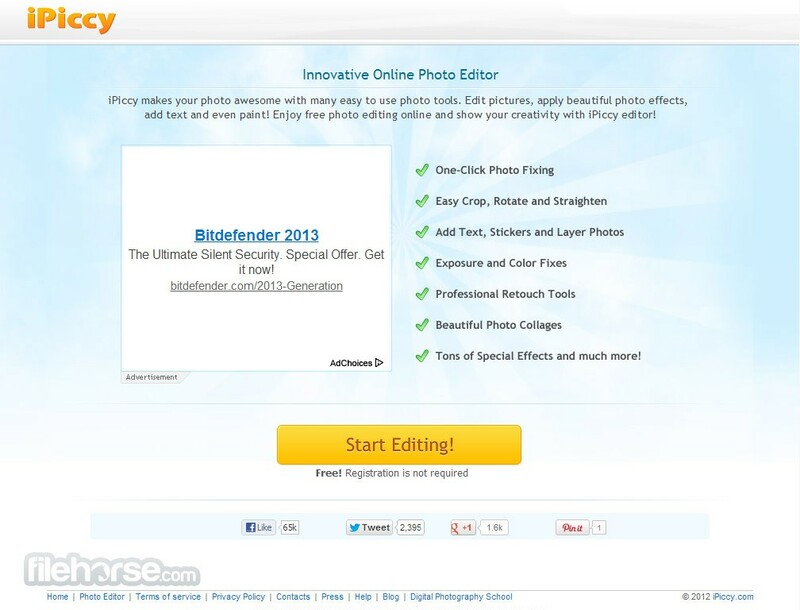 Editor of iPiccy is specially crafted to be easy to use, intuitive, but powerful. You can edit your photos with few clicks - easily crop, rotate, straighten images, fix colors and exposure, retouch them with professional tools, add texts and stickers, work with layers, add frames, change textures, and much, much more. Even though iPiccy offers many things, everything is made available for you for absolutely free, without the need to register. If you have to edit a picture and you don’t want to hassle yourself with installing dedicated editing app, iPiccy is a perfect solution for you. All that you need is an internet connection and a modern browser! Amazing Online Photo Editor! For a long time, image editing was viewed as something challenging, forcing home users to invest time to learn how to control complicated standalone applications that they needed to install on their computers. This approach managed to significantly change with the arrival of cloud processing and spreading of internet infrastructure and standards that empowered modern browsers to run any kind of applications. This enabled developers to create highly intuitive and easy to use editors that offered easy tools for image manipulation, adding of effects and image management that can be achieved even by novice users. One of the best webapps of that kind is iPiccy, which was founded by March of 2011 under the leadership of Alex Bespechny who had the goal of making image editing easy and fun. In very short time, this website managed enter into the list of top 10,000 most visited websites in the world, surpassing many of its competitors and offering everyone comprehensive list of tools for easy image manipulation. iPiccy is one of the most easiest and intuitive image editing apps that are hosted on the cloud and available to be used by anyone who has internet-connected computer and a modern browser. To enable maximum compatibility and ease of use, iPiccy can be used without the need for installing any plugin, extension or anything else, providing reliable service to users of all technical knowledge levels who are only required to fire up their browser and visit iPiccy website. Upon arrival on iPiccy, users will be asked to start editor and load image of their choice either from local storage, webcam, or online sources such as URL, Flckr, or even start a new painting. After loading image, you will be transported into dashboard interface that anyone can effortlessly manage. On the top main categories of tools are listed – Photo Library, Basic Tools, Photo Effects, Retouch, Blender (for layer and sticker management), Painter (for painting brushes), Frames, Textures and Saving. All of those buttons activate tool listings on the bar on the very left of the dashboard, listing dozens of effects and tool that can enable you to completely customize images and photos to your liking. Undo and Redo buttons are easily accessible, as well as Photo Library tool which serves as manager for all your uploaded and saved images which is especially useful for managing collages, photo restorations and blender images. Amazing Online Photo Editor! As we have already described, interface of iPiccy is very easy for use, enabling easy tool category picking on the top of the dashboard, and listing of selected tools on the left of the screen (often more than 30 of them per category). With this approach iPiccy manages to easily showcase hundreds of tools that can significantly change the way your images look. Saving process is also streamlined, enabling saving to local storage (file name, JPG and PNG file formats, quality slider), Facebook export and saving directly into your own Flickr image library. iPiccy can be used for free. 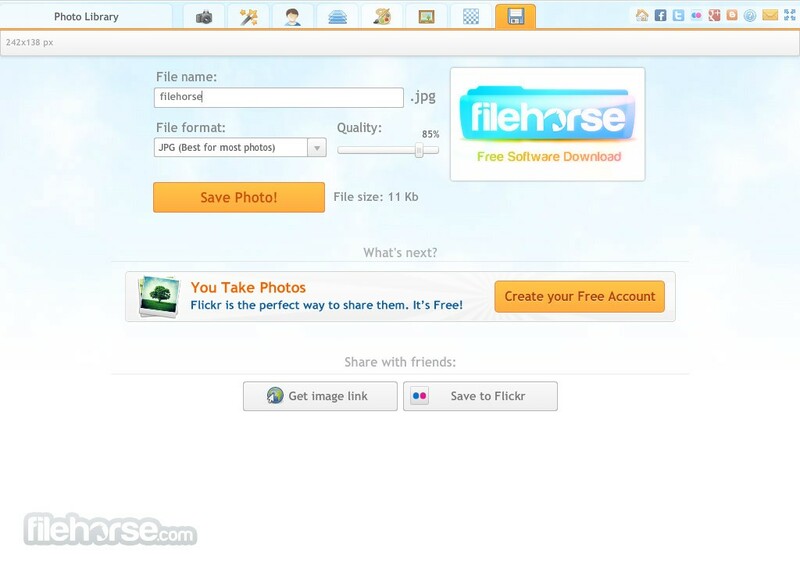 Registration is needed if you want to maintain image library directly on iPiccy. After just few seconds with this app, anyone will be able to easily control this intuitive image editing application, and prepare all their images for online sharing, storing or incorporating them into your home, school or work projects.